The fastest path to becoming a registered nurse (RN) is an associate’s degree in nursing (ADN). While a bachelor of science in nursing (BSN) takes four years to complete, an ADN takes just two to three years, and qualifies you to take the National Council Licensure Examination (NCLEX-RN). If you decide to earn a higher degree down the road, ADN programs also qualify you to enter BSN or RN to master of science in nursing (RN-to-MSN) program. ADN programs are offered at four-year universities, community colleges, technical schools, career colleges and hospitals. Some programs may be completed online at schools such as Excelsior College. Accredited by the Accreditation Commission for Education in Nursing (ACEN), the program requires 67 credits—31 in general education and 36 in nursing. The general education component includes information literacy, written English, humanities, social sciences/history, natural sciences/mathematics, and free electives/arts and sciences electives. The nursing component is divided into four phases including Nursing Theory Series I and II, Focused Clinical Competencies Assessment (FCCA), and Clinical Performance in Nursing Examination (CPNE). Upon completion of the program, students are prepared to take and pass the NCLEX-RN. 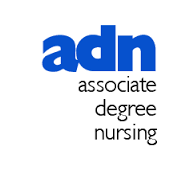 Graduates of accredited ADN programs are in high demand at hospitals, clinics, long-term care facilities, outpatient centers, physician’s offices, residential care facilities, nursing homes and home health care. While salaries can vary depending on workplace, experience, specialty, geographic location, and other factors, most nurses fare well. The median annual wage for RNs was $68,450 in May 2016. High performers earned more than $102,990. Start preparing for a rewarding career in nursing. Enroll in an online ADN program today! We’ve compiled below a list of accredited schools with an online associate’s degree in nursing to help you get started.